The new ban is affecting users found to be in breach of the Nintendo 3DS terms of service. Nintendo has never been very friendly to hack-minded players, and for good reason: tech-savvy users, of the type who like to do things like install custom firmware on their Nintendo 3DS, are able to access emulators and play pirated games on their system without paying Nintendo a single cent. To call it disruptive to Nintendo's business plans would be putting it mildly, and the company has recently struck back at players who have hacked their 3DS systems with a new ban that disables all 3DS online functionality. "Error Code: 002-0102. 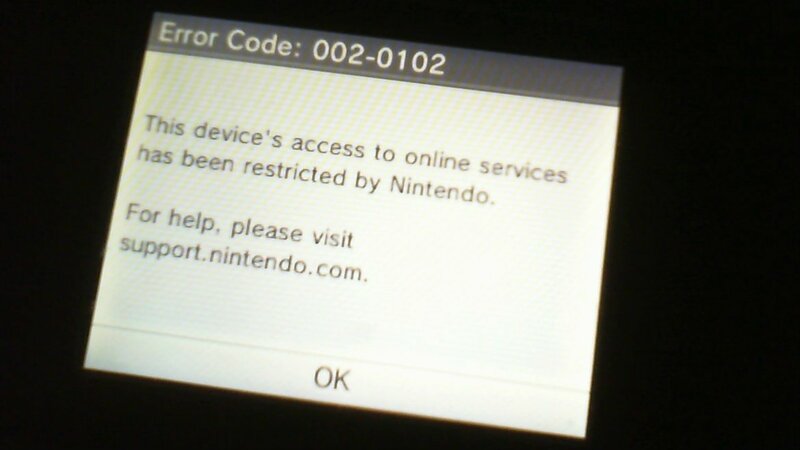 This device's access to online services has been restricted by Nintendo. For help, visit support.nintendo.com"
"As a result of a number of users making unauthorized system modifications, playing unauthorized versions of one or more games and/or connecting to the game servers in violation of our terms of service, Nintendo has banned those users’ systems from accessing its online network, effective immediately." While many affected users have readily admitted that they've been running custom firmware on their 3DS systems, there are many others who are unsure of how or even why they've been affected by the ban. Regardless, every user who has seen Error Code 002-0102 has reported that online functions like Miiverse and the Friends List are no longer working, and unless Nintendo has a very-unlikely change of heart, it seems that their systems will forevermore lack access to online connectivity and social functionality. Fortunately, services like the eShop and web browser appear to be unaffected. Have you quelled the urge to run bootleg software on your Nintendo 3DS? If so, reward yourself with one of the durable and attractive cases featured on our list of the Best Nintendo 3DS Cases.